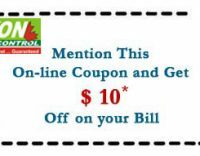 SPECIAL OFFERS or COUPONS We have a $10 DISCOUNT for any residential treatment, including bed bugs, cockroaches, silverfish, household ants, spiders, wasps, rodents and fleas etc.. Note: Coupon is applicable for more than $100 invoice. Just mention this coupon and you are eligible for $10 off your next treatment. * Some Conditions Apply.